Every now and then, I eat in a restaurant where I have an absolutely perfect meal. 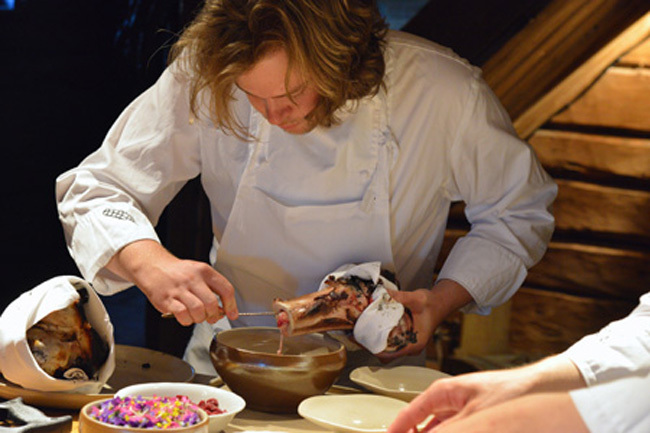 Recently, it was at Lyle’s where James Lowe cooks beautiful dishes that are light, elegant and totally exquisite. A year or so ago, I finally ate at Faviken and Nilsson’s food was just as light and elegant and possibly even more pure than Lowe’s. In between, I went to Blue Hill at Stone Barns where I have been wanting to go for years but never got round to it until, that is, my new wonderful agent, Nicole, took me there to celebrate my joining her agency. 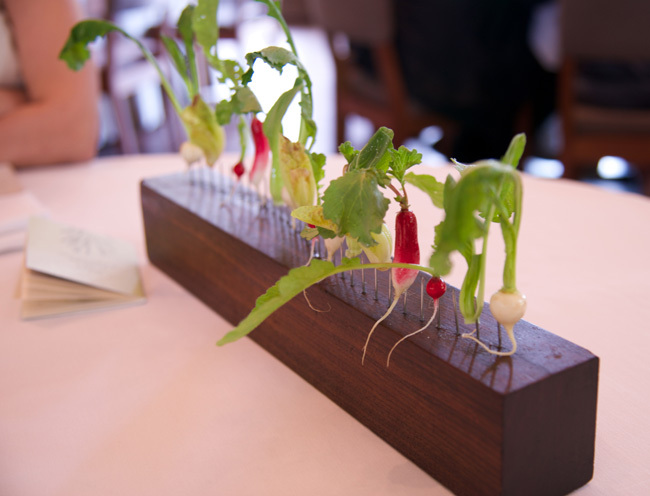 Our meal there was also memorable, for the setting, the company and of course the food which was delightful, starting with this lovely arrangement of freshly picked radishes, each individually spiked onto a long wooden log. They were served alongside the crunchiest and most delicious ice lettuce (or ficoïde glaciale) which I was tasting for the first time, tiny baby carrots with their tender stalks and leaves on, asparagus, greens spiked into edible earth, a delightful drink and various delicate sauces to dip this incredibly fresh bounty into. Below, you can see some of the selection arranged on my plate — the dark blob is beetroot jerky — and I have to say vegetables never tasted so good, nor looked so pretty! I will always regret it. The year must have been 2002, perhaps even earlier. 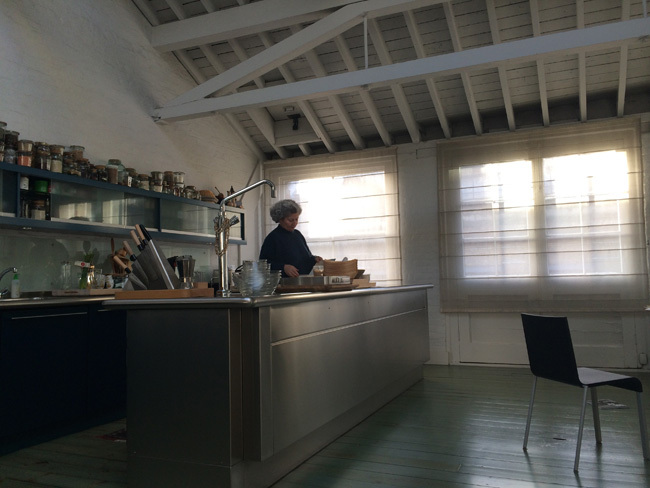 I had rented a flat in Barcelona to test recipes for my offal book and was there for 3 weeks. During that time, I could have easily gone to El Bulli whenever I wanted. I had a well-connected friend who would have organised it for me — in fact he had organised an amazing offal dinner at Can Fabes and an exquisite lunch at Ca L’Isidre where the owner gave me their recipe for tripe. But El Bulli was far and I was not so taken by molecular cuisine after a disappointing meal at the Fat Duck. So, I didn’t even try to get a booking. Then it became incredibly difficult to get in and now it is closed. Since then, I decided never to miss eating at a restaurant I was interested in even if it means travelling. 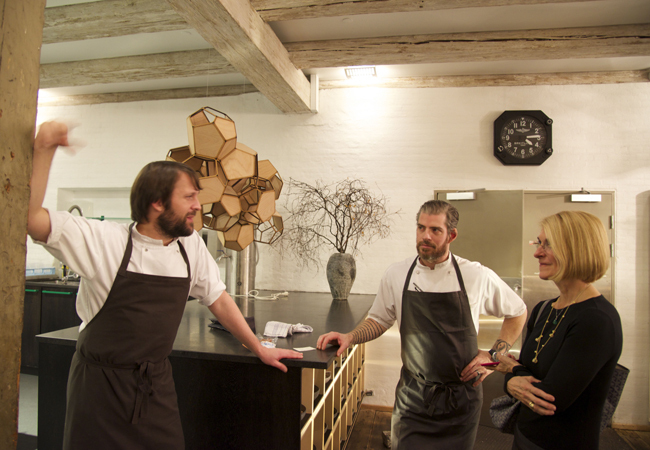 Last year I went to Noma and I am just back from Faviken where I had the most amazing dinner followed by a terrific breakfast in the most serene if slightly ascetic atmosphere.